Hello and happy Friday! 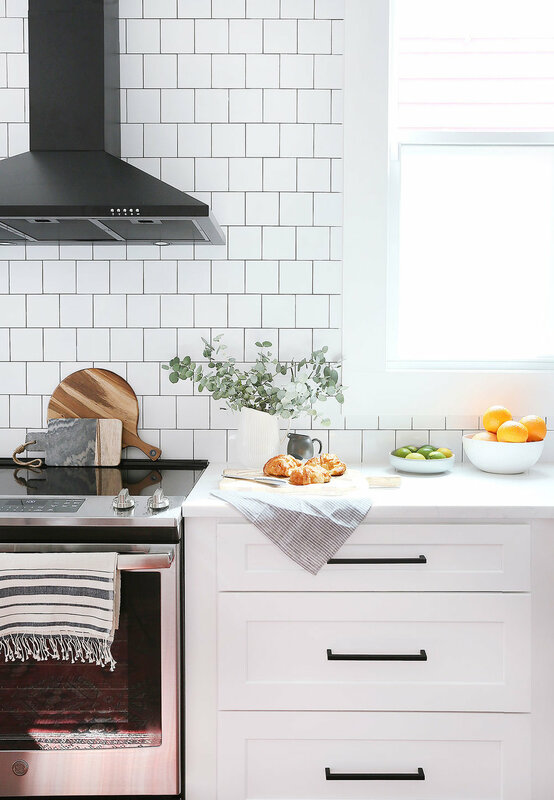 Today, I’m going to walk you through one of the brightest and cheeriest kitchens you ever did see! This kitchen is another really amazing space in this incredible New Orleans house that I’m so pumped to share with you. And man, its good! I wish this was my kitchen! My clients worked with Angela Murtagh to re-think and re-configure the layout. At 12 1/2 feet wide, it’s a very narrow space but they knew they could maximize space by opening up one of the walls between the kitchen and the living and dining areas. 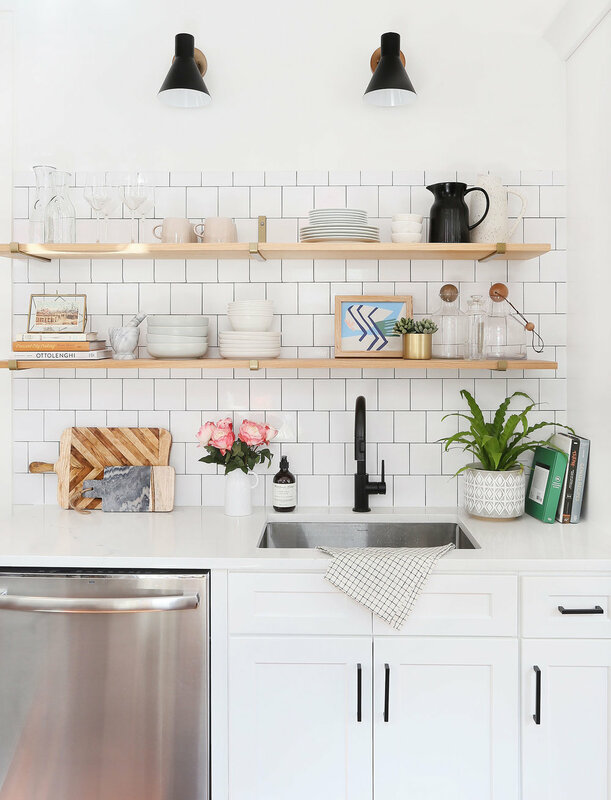 In addition to changing the basic footprint, they also nixed the top row of shelves in favor of all that glorious open shelving (made from Cypress and installed with these metal brackets) and installed new custom cabinetry and appliances. How pretty is that view? 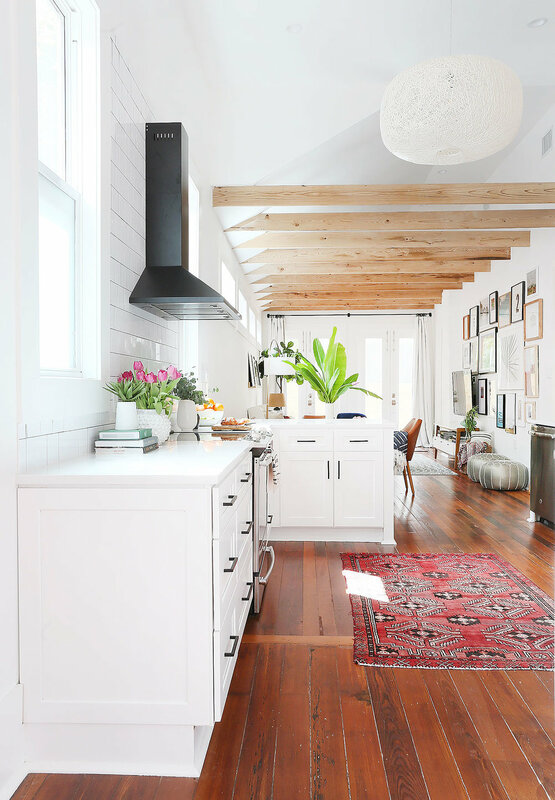 The black and white from the kitchen mixed with the warmth from the original heart pine floors and 200 year old Cypress beams makes my heart sing! Its such a bright and magical place! My client’s taste leans more modern and they wanted the kitchen to feel simple, clean and flow with the rest of the living and dining areas. 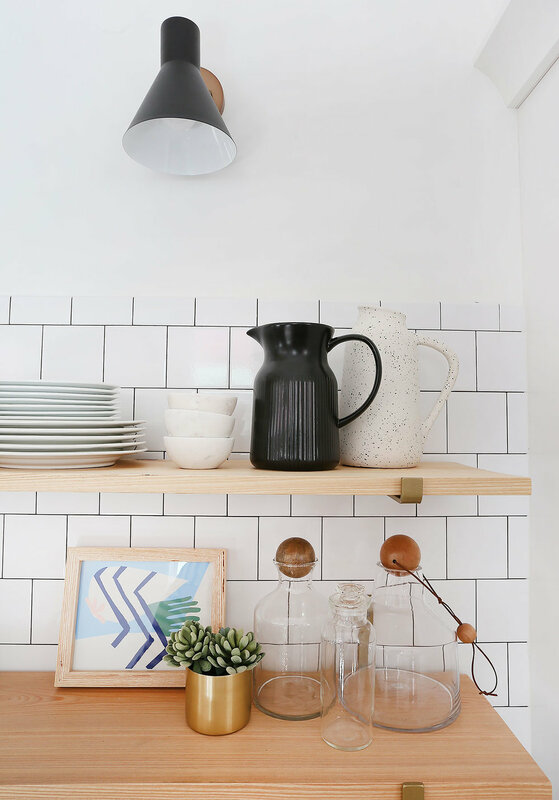 To keep things cohesive, we painted the entire house BM Chantilly Lace and chose that beautiful quartz countertop, paired it with custom shaker cabinetry designed and sourced from Itty Bitty Kitchens and those amazing matte black Schoolhouse pulls. 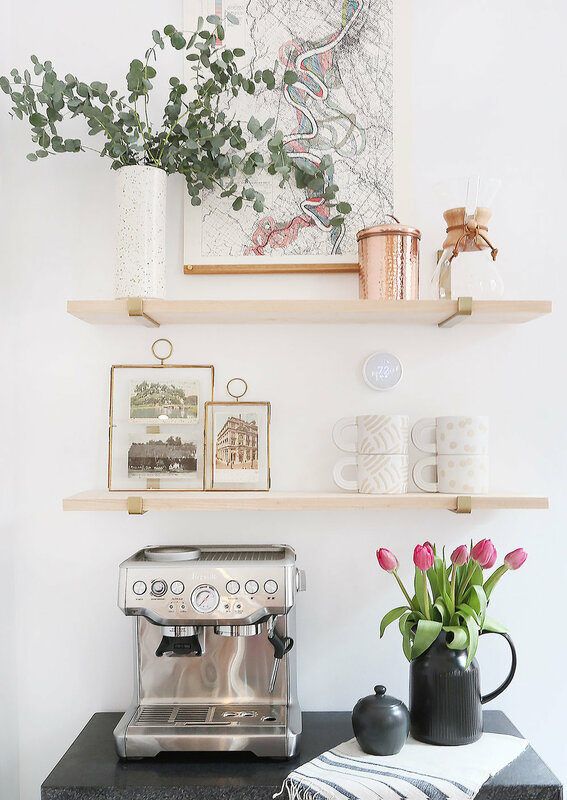 My clients are big coffee people (and I got all the good New Orleans coffee during my stay) so we created this little coffee station moment in this corner and pulled in the same Cypress wood for more open shelving. I can’t get enough! Let’s take a peek at the other side of the kitchen and enjoy that bold contrast and impact from the matte black stainless steel hood vent! I can’t really take credit for that choice - it was all my clients and so affordable ($140)! We bought those fresh croissants that morning from a bakery in the French Quarter and they just sat there for hours taunting us with all their delicious buttery goodness. We had to hold strong through because food makes the best styling props! Don’t worry…they were taken care of after the shoot. Truly, I had some of the best food of my life while in New Orleans! I’d also love to take a moment to truly appreciate these open shelves! They are made from Cypress and are the prefect warm balance against all the black and white in the kitchen. After a couple of days of styling and then using them, I started to think of ways I could install them in my own kitchen! That sconce was an amazingly affordable find that really completed the space. It was surprisingly substantial and well-made for being under $50! Man, I wish this was my actual kitchen! I did very little editing to these images - it really is that bright and happy! What do you guys think?